Radical Love (14th February – 6th March) is a quirky exhibition located in the compellingly obscure Crypt Gallery in King’s Cross. Four big statues guarding the entrance, you walk down into the crypt – little more than a crumbling cave – and are greeted by a cheerful Robin and a strong whiff of just time. The exhibition, which will be going to the Women of the World Festival in Chester in May, centres on 11th-century poems by Arab women. Róisín O’ Loughlin stumbled across one of these poems on a train one day and was inspired. She figured other artists might be inspired as well, and she was right. She sent out poems to 48 artists across the world, 24 to the Middle East and 24 to all other possible places, and various artists who’d never met each other responded to her. Reading the poems resulted in a broad range of works: sculptures, oil paintings, watercolours and photography, to name a few. Female Arab poets of the 11th-century may seem a particularly niche category, but that’s exactly what Radical Love addresses. The poems are, if anything, relatable. Perhaps surprisingly brutal in their portrayal of the body and bodily desires, the voice of these women is strong. Not afraid of their femininity the poems expose a millennium of a refusal of patriarchy. Throughout the centuries, the bodies and position of women in society has been through much and survived much, but this exhibition reveals that the minds of women stand solid as ever. Appropriately, half of the profits from this free exhibition go to the Global Fund For Women Helping Syrian Refugees. I don’t know what shocks me more: the brazen lines of poetry, “plough into me” and “all I want is to win him”, or the fact that I was not expecting any of it. They are without apprehension, entirely natural, and an honest account of lust and desire. I quickly welcome the honesty. Is honesty radical? A majority of the paintings and drawings are a brilliant explosion of colour and confident strokes. Another part is demure – photographs of simple colours emphasising shadows. These latter works, I notice, are influenced by the male presence and oppression in the poems. The bright colours seem to emanate self-possession and self-confidence. Coincidentally, The Radical Eye (running until 21st May) is on show at Tate Modern. Compared to its namesake, is this the same kind of radical confidence in desire, or indeed, the same radical honesty? It definitely responds to an emerging need for ‘radicalism’ after the whirlwind of 2016. This exhibition takes us through photography of the modernist era from the 1920s – 1950s, in which you find yourself connecting to unfamiliar individuals, as well as crowds. The collection, loaned by Sir Elton John, shows portraits ranging from simplistic styles picturing the likes of Pablo Picasso and Charlie Chaplin, to avant-garde collages of Kiki de Montparnasse, and includes the famous ‘Migrant Mother’ of 1936 and her two boys. 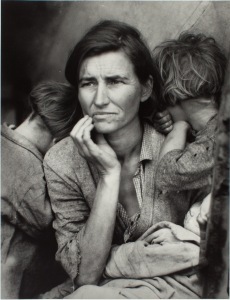 The works of Man Ray and Dorothea Lange are cornerstones in the world of film, showcasing just how radically the world before us can be altered through a lens. Perhaps what struck a chord with me the most was the collection of famous personalities portrayed in bare corners, alone. How easy it is to be cornered by, well, anything – by a lover, by the pressures of the media, by your own thoughts. The Radical Eye is a journey through portraits, objects, the body, surrealism and the city. I can’t help but observe that the world-renowned art works here echo the things I’ve seen in the Crypt Gallery. Man Ray’s ‘Glass Tears’ shows the woman up, close and personal, caught between emotion and sparkling beauty, whereas in Radical Love I encountered a collection of photographs of a young girl in tears and a portrait of a Muslim woman whose face was covered in patterns of luxurious textures. With no poems to speak for the inner eye at Tate Modern, photographs of the body become the voice of intimacy. Unapologetically positioning both men and women, separately and together, athletic and otherwise, in various frames, these photographs show the body honestly and beautifully. Not quite the same vessel of desire as in Radical Love, but they evoke a sense of shameless self-awareness. Magical and radical love and vision connect all things, from sculpting to photography, and from ears of wheat to bare shoulders. Leaving both the world-famous Tate Modern and the obscure Crypt Gallery, the world somehow seemed more encompassing than before. I saw myself in the 11th-century Arabic poems, Englul Aslan’s oils in ‘Body’s Door’, and Emmanuel Sougez’s ‘Body in Motion’. The Radical Eye is a visionary journey through surrealist photography, but perhaps the more radical of these two, Radical Love, tugs at my heartstrings and all sorts of other innately human strings as well. I feel more confident in bearing my soul and responding to my own radical heart. Nelli Kirla is half-Finnish, half-Canadian, and lives in London. She is currently studying English and Film at King's College London.